After 12 weeks of everything from the basics to online banking, the 36 members of the very first Connect @ Home class graduated from the program. 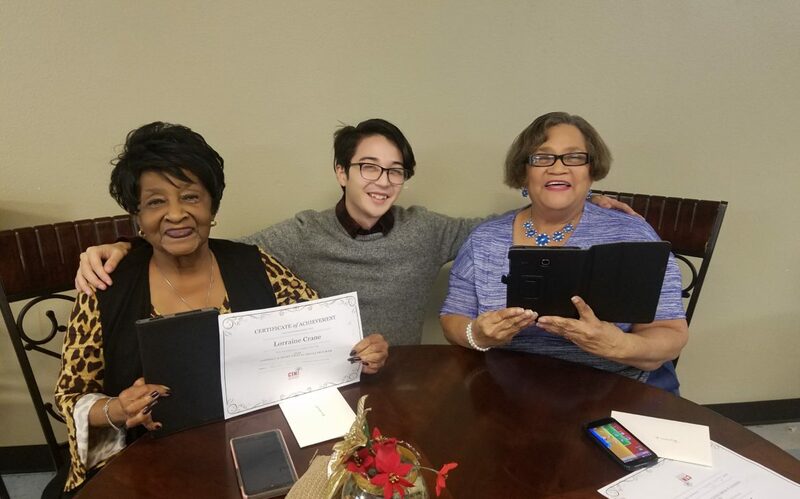 Community Tech Network, Family Eldercare, and local resident staff came together over coffee and donuts to celebrate the graduates. It was an opportunity for us to reflect on the program and what we each had learned. I closed out each celebration with the same message to my learners: This program is just the beginning. The amazing part of technology is the way it empowers individuals to reshape their lives. They find new interests and new friends to share them with. The internet connects us to people we never thought we’d be able to see again, and those we always wish we’d see more of. Most importantly, every learner now has a device to go farther and learn even more. I can’t wait to hear about all the amazing things these graduates go on to do with their devices.